Many congratulations to Duygu Bektik (née Simsek) whose PhD is now available! Duygu passed with flying colours — truly a landmark in one’s life 🙂 Thank you to Rebecca Ferguson, Denise Whitelock and Ágnes Sándor (Xerox) for supporting her through to the end. Bektik, Duygu (2017). Learning Analytics for Academic Writing through Automatic Identification of Meta-discourse. Doctoral Dissertation, The Open University, Milton Keynes, UK. Effective written communication is an essential skill which promotes educational success for undergraduates. Argumentation is a key requirement of successful writing, which is the most common genre that undergraduates have to write particularly in the social sciences. Therefore, when assessing student writing academic tutors look for students’ ability to present and pursue well-reasoned and strong arguments through scholarly argumentation, which is articulated by meta-discourse. Today, there are some natural language processing systems which automatically detect authors’ rhetorical moves in scholarly texts. Hence, when assessing their students’ essays, educators could benefit from the available automated textual analysis which can detect meta-discourse. However, previous work has not shown whether these technologies can be used to analyse student writing reliably. 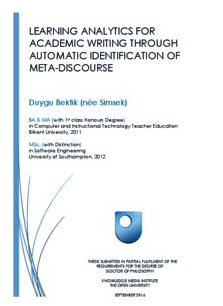 The aim of this thesis therefore has been to understand how automated analysis of meta-discourse in student writing can be used to support tutors’ essay assessment practices. This thesis evaluates a particular language analysis tool, the Xerox Incremental Parser (XIP) as an exemplar of this type of automated technology. The studies presented in this thesis investigates how tutors define the quality of undergraduate writing and suggests key elements that make for good quality student writing in the social sciences, where XIP seems to work best. This thesis also sets out the changes that needs to be made to the XIP and proposes in what ways its output can be delivered to tutors so that they make use of this output to give feedback on student essays. The findings reported also show problems that academic tutors experience in essay assessment, which potentially could be solved by automated support. However, tutors have preconceptions about the use of automated support. The study revealed that tutors want to be assured that they retain the ‘power’ themselves in any decision of using automated support to overcome these preconceptions.